A new bridge that bends during a strong earthquake and not only remains standing, but remains usable will be debuting in its first real-world application. It will be as part of a new exit bridge ramp on a busy downtown Seattle highway. We've tested new materials, memory retaining metal rods and flexible concrete composites, in a number of bridge model studies in our large-scale shake table lab, it's gratifying to see the new technology applied for the first time in an important setting in a seismically active area with heavy traffic loads. Using these materials substantially reduces damage and allows the bridge to remain open even after a strong earthquake. In the lab, Saiidi, who developed this technology, has constructed and destroyed, a number of single bridge columns, large-scale 200-ton bridges, and concrete abutments using many combinations of novel materials, replacements for the regular steel rebar and concrete materials and design in his search for a safer, more hard-wearing infrastructure. "We have solved the problem of survivability, we can keep a bridge usable after a strong earthquake," Saiidi said. "With these techniques and materials, we will usher in a new era of super earthquake-resilient structures." The University collaborated with the Federal Highway Administration and the Washington Department of Transportation to execute this new technology on their large-scale Alaska Way Viaduct Replacement Program, the main feature of which is a two-mile long tunnel, but covers 31 individual projects that started in 2007 along the State Route 99 corridor across downtown Seattle. "This is potentially a giant leap forward," Tom Baker, bridge and structures engineer for the Washington State Department of Transportation, said. "We design for no-collapse, but in the future, we could be designing for no-damage and be able to keep bridges open to emergency vehicles, commerce and the public after a strong quake." Advanced bridges are engineered to not collapse during an earthquake, and this latest technology takes that design a step further. In the earthquake lab tests, bridge columns constructed with memory-retaining titanium/nickel rods and a flexible concrete composite returned to their original shape following a strong earthquake measuring 7.5 in the Richter scale. The tests we've conducted on 4-span bridges leading to this point aren't possible anywhere else in the world than our large-scale structures and earthquake engineering lab. We've had great support along the way from many state highway departments and funding agencies like the National Science Foundation, the Federal Highway Administration and the U.S. Department of Transportation. Washington DOT recognized the potential of this technology and understands the need to keep infrastructure operating following a large earthquake. In an experiment conducted in 2015, a bridge constructed by Saiidi moved over six inches off center at the base and returned to its former position, as engineered, in an straight and stable position. Using the computer-controlled hydraulics, the earthquake engineering lab can amplify the intensity of the recorded earthquake. Saiidi turned the dial up to 250% of the design parameters and still witnessed excellent results. "It had an incredible 9 percent drift with little damage," Saiidi said. 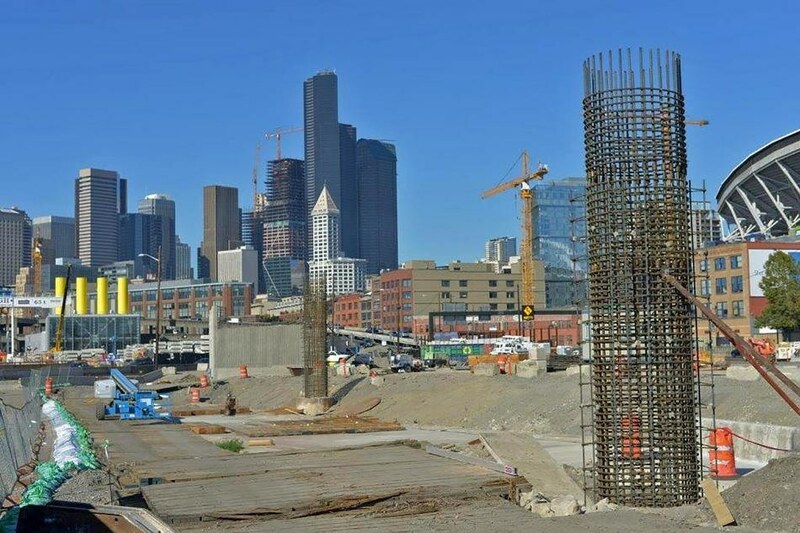 The Seattle off-ramp with the novel columns is presently under construction and may be ready sometime in spring 2017. Once the new SR 99 tunnel is inaugurated, this ramp, south of the tunnel entrance, will take northbound drivers from SR 99 to Seattle's SODO neighborhood. A new WSDOT video shows how this innovative technology functions. Dr. Saiidi sets the mark for the level of excellence to which the College of Engineering aspires. His research is original and innovative and has made a seminal contribution to seismic safety around the globe.